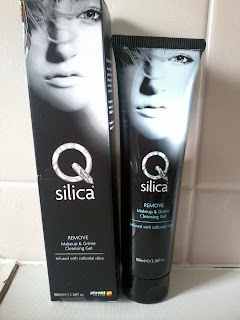 If you read my blog post about The Free From Skincare Awards you will know that the overall winner was Q Silica Remove Makeup & Grime Cleansing Gel. Planet Health who stock the brand kindly sent the cleanser to review. Q Silica comes from Australia and is free from parabens, sulphates, petroleum and “other nasties”. I do wish Companies would refrain from saying "other nasties" it would be nice to know what these are. The ingredients for the cleanser are - Water, Glycerin (botanical source), PEG-120 Methyl Glucose Dioleate (from sugar), Cocoamidopropyl Betaine (from coconut), Caprylic / Capric Glucoside (from coconut & sugar), Sodium Lauroamphoacetate (from palm), Silica, Phenoxyethanol, Citric Acid (from corn/maize), Sodium Chloride, Lavandula Angustifolia (Lavender) Oil, Tocopherol (Natural Vitamin E), Simmondsia Chinensis (Jojoba) Seed Oil, Persea Gratissima (Avocado) Oil, Agonis Fragrans Branch/Leaf Oil, Santalum Spicata (Australian Sandalwood) Oil, Ethylhexylglycerin (botanical source), Melaleuca Leucadendron Cajaputi (Cajuput) Oil. You will notice that a preservative is used (I’ve highlighted it). It has been a long time since I have used a cleansing gel. I do favour balms and most recently oil. It has a mild fragrance and my nose picks up on the lavender. The gel is clear and when applied to damp skin creates a creamy smooth lather. It does dispense from the tube easily but be cautious, I left the lid flipped open, tube lying on its side and the cleanser ran out onto the bathroom counter. I admit it was a rather dopey thing to do but all my other cleansers are in jars or bottles so I did not give it a second thought. I decided to stop using this cleanser after about ten days of continued use morning and evening. Over time I felt my skin become tight and my chin started to develop dry patches, something that I have not suffered from in many months. My skin became uncomfortable and I was not prepared to continue testing. I switched back to a balm cleanser and my skin felt instantly better. Obviously, there are factors to consider which may have affected how this product worked on my skin such as hormones and changing weather. I had high hopes for this cleanser but it was not meant to be. I love what the brand offers in terms of ingredients policy and overall the cleanser does the job it’s designed to do. Most cleansers suggest which skin type it suits but I notice that neither the website nor packaging make reference to this so they obviously feel one product fits all. It would be my personal recommendation that this cleanser may be better suited to those with normal, combination and oily skin rather than dry and eczema types such as myself. I'm the same as you, I much prefer balms and oils, also creams. Shame it didn't work for you.